If you live alone like me, it’s good to find a way to take you out of yourself, writes Christine Grahame MSP. I have the privilege this week for three days, with the Parliament in recess for Easter, of having one of my granddaughters, aged almost eight, staying with me and Mr Smokey (rescue cat). This will mean adjustments, which is no bad thing as you can get into a big rut when you live alone. Now don’t get me wrong, I don’t mind living alone and it’s rare I feel lonely, though this is not true of many pensioners, but more of that later. Back to those adjustments. I’ll start with the fridge. Stocking up for one is the norm, though I often find I just can’t eat my way through all the fruit which comes prepacked and Mr Smokey’s not keen on mouldy grapes – neither are the sparrows for that matter. Extra milk is easy, bananas go down well, but which pizza toppings are off the menu? Breakfast is fine with cereal, though a treat at grannies is square sausage cut into soldiers to dip in runny egg, a speciality of mine. Eat your heart out Master Chef. Choc ices are a treat as we snuggle to watch a ‘movie’ – mum is Canadian. Bedtime brings its challenges. It’s still a bit of an issue when bedtime begins and ends. Let’s say there’s a bit of negotiating which Theresa May could do with on team Brexit. At least now that she’s a bit older I don’t find myself roused at the crack of dawn by a wee face staring into mine as I try to retreat under the covers. But you get to bring out the poster paints, go for walks where you haven’t walked for years, watch films for the umpteenth time so you can even deliver the lines, read books together and generally don’t get to sit on your laurels or indeed your bahookie for any length of time. Then she is back into her family fold and me and Mr Smokey can resume our usual positions – me on the couch with feet on the pouffee and he with his back toasting by the fire. 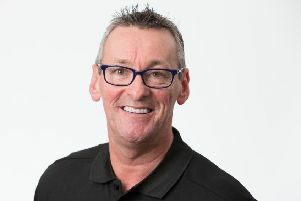 Jim Duffy comment: Does the Bitcoin rise signal the next cryptocurrency bull run? Yet I am indeed privileged, for there are too many folk my age who have no reason to leave the couch or afternoon telly, who never have a phone call apart from the unsolicited cold call. The only mail received are circulars. Now you don’t need a grandchild or a cat to prise you from the cushions. There are organisations, churches, libraries, brimming with ideas to take you out of yourself. Neighbours too can help, though with tact because no-one wants to think they are a ‘rescue job’. Spring is round the corner so make the most of it. If you are mobile, use that bus pass and take a trip, why, even as far as Glasgow! Or Midlothian and the Borders for that matter. A wee walk to the bus stop may be all you can manage, but you will feel the better for the achievement. Now why sparkly tights? Granddaughter invariably gives the excuse when she sports yet again, no matter what else she wears, sparkly tights. Challenged, she always claims she wore them “by mistake”. I don’t think so, but who cares? As she whirls and dances in her sparkly tights, she makes life seem so much cheerier. You can always wear sparkly tights under yir troosers.